Fast forward to May 2010, nearly a year and a half after our arrival here, and here I am again. The thing that may strike you first is that I'm pink once more. But this time I am neither sunburnt nor drunk. Oh no! 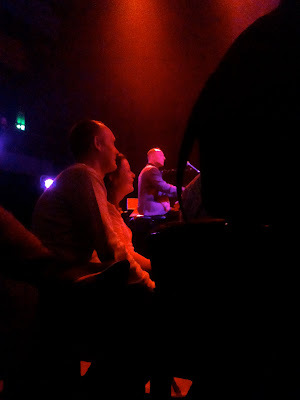 I'm bathed in the soothing glow of the Opera House's spotlights, performing on the studio's stage last Saturday with Natalie Gamsu in something called Late Night Lounge (a sort of cabaret compendium of, and I'm quoting here, top talent). "Your neo-classical, rock ‘n’ roll, variety, cabaret, chat show experience!" I would like to point out that, not only were we making our Opera House debut but we were also performing two of my songs, along with a marvellous cover of Britney Spears's Hit Me Baby One My Time with which we opened. The entire show. 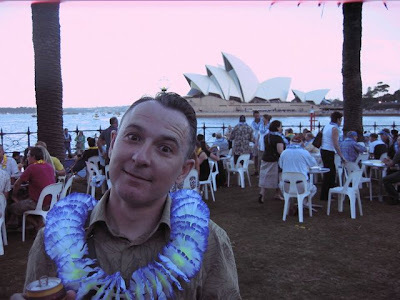 Which unfortunately meant that the first thing I did on the Opera House stage after playing just three chords on the piano was to slap my arse and scream into a microphone....My youthful dream of standing in front of a full orchestra ready to play the Nielsen Clarinet Concerto on the Sydney Opera House stage didn't quite work out as planned. But I am more than grateful it didn't, this was much more fun. 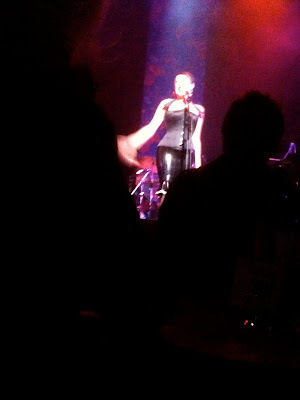 Daniel took these illicit shots with his iphone which is obligatory gig behaviour. I can't understand why the two people in the audience in the photo of me are looking at Natalie rather than over towards me. I had a new jacket on as well. Next time I'll wear lycra too, that should nail 'em. There was also a man (a rather well-known singer apparently) called Iota backstage, waiting to go on after us. Having no surname is obviously de rigeur these days, but having a first name like Iota? I obviously need to change Jonathan Cooper to Pixel or Jot or Spitlickle. Also on the bill was a drag artist called Trevor - Natalie and I have played for him at his weekly cabaret nights - whose personality is as overwhelming as his dresses. 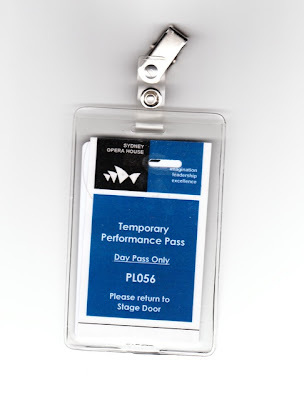 I'm so sad, I stole my performer's day pass instead of returning it to the stage door. But it serves them right because my name wasn't at the door anyway. Natalie had to persuade them that I was indeed an artist as security were in a very feisty mood as both the Prime Minister and the State Premiere were knocking about the Opera House having welcomed round-the-world sailor Jessica Watson back to Sydney (a story which I don't think will have impinged on anyone's consciousness outside of Australia). How dare they?! Next time, they better KNOW who I am! Why Neilsen's clarinet concerto - why not Stravinsky's 3 pieces for clarinet solo? I have somewhere a tape cassette recording taken from your BBC Radio 3 broadcast. A lot of water has passed under Beencke's bridge since then. Clearly you two were the standouts of the evening and I guess there was no video or we would be seeing it. I know it was hilarious and touching as well as I know you to be. I am always on your virtual guest list so do keep me living vicariously through your blog and posts.